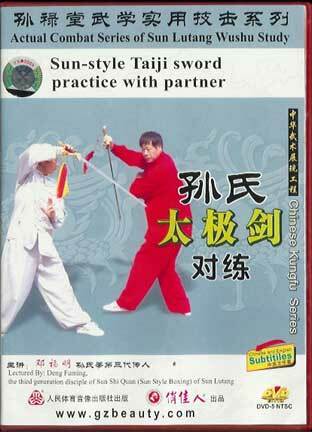 There is a saying, "Tai Chi covers the North and Wing Chun covers the South." There's no disputing, Wing Chun Pai is one of the most popular of Kung Fu styles. Many people say this is due to its practicality and superior fighting technique. This may be so. What Wing Chun has also retained and so many Chinese styles have lost, is that its training is tactile, personal and usage oriented. Some of these DVDs particularly don't even show forms, just lots and lots of usage. This is advantageous to ALL students of Chinese martial arts as a standard for what must be retained to keep the art alive. Teacher Randy Williams began training under George Yau at the age of 13 then went on to train with the famous and demanding Augustine Fong and Ho Kam Ming of Hong Kong. His movements are classic, precise and accurate. His presentation is to the point and gets you into the movements and the applications immediately. He is the founder of CRCA, a large Wing Chun organization. Williams is a born teacher. 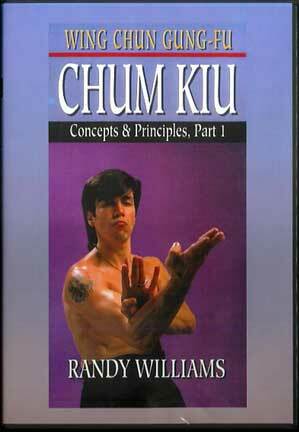 Wing Chun itself is well structured but Williams has a teacher's mind using analogies, drills, jokes and images to get each point across. NOTE: These are remakes of Unique's original VHS series. They saved a buck and just transferred the VHS to DVD without menus and such frills. Think of them as flat video tapes. If the comparison to Mystery Theater 5000 seems obvious it is Williams Sifu's own fault. 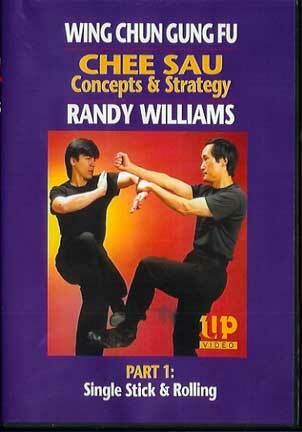 This DVD and others in the series (and this is the only series we know that has this) show continual Sticky Hands fighting between Randy Williams and some of his students while the interested parties comment, often humorously, about what’s occurring on screen. Another way to think of these DVDs as the equivalent to the “Director’s Commentary” of a movie. Actually it is a very effective method for analyzing the back and forth fighting in pretty close to real time. Though certainly set around the information in Chum Kiu this sometimes wild and wooly presentation of full speed Sticky Hands uses many techniques form the Wing Chun system in their spontaneous, unrehearsed and lively applications. This is a great one if you want to see Sticky Hands, reality style. Williams and company demonstrate wry humor and good camaraderie in their commentary. If the comparison to Mystery Theater 5000 seems obvious it is Williams Sifu's own fault. This DVD and others in the series (and this is the only series we know that has this) show continual Sticky Hands fighting between Randy Williams and some of his students while the interested parties comment, often humorously, about what’s occurring on screen. Another way to think of these DVDs as the equivalent to the “Director’s Commentary” of a movie. Actually it is a very effective method for analyzing the back and forth fighting in pretty close to real time. Though certainly set around the information in Biu Jee this sometimes wild and wooly presentation of full speed Sticky Hands uses many techniques form the Wing Chun system in their spontaneous, unrehearsed and lively applications. This is a great one if you want to see Sticky Hands, reality style. Williams and company demonstrate wry humor and good camaraderie in their commentary. 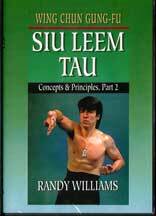 In this part of the series Randy Williams goes into great detail to show the roots of the drills embedded in the Siu Leem Tau form. He starts with the complete form while giving voice-over narration. As he progresses through the form he shows multiple meanings and uses for each and every motion. There is some repetition of earlier drills but the context here is conceptual more than just practice. This is the FIRST part of TWO DVDS. 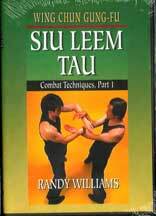 In this part of the series Randy Williams goes into great detail to show the roots of the drills embedded in the Siu Leem Tau form. He starts with the complete form while giving voice-over narration. As he progresses through the form he shows multiple meanings and uses for each and every motion. There is some repetition of earlier drills but the context here is conceptual more than just practice. This is the SECOND part of TWO DVDS. The Mystery Science Theater 3000 approach to instruction. There are about 400 jokes on this narrated presentation of continuous Wing Chun sparring with multiple students and teachers. Williams and two cohorts comment on his own real time fighting footage of sparring. 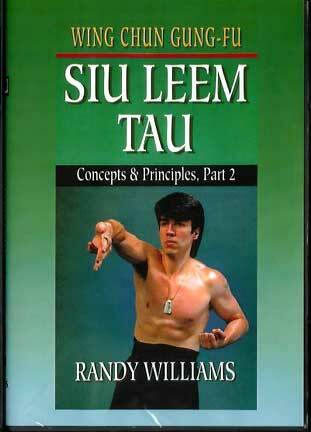 Williams points out the applications of the Siu Leem Tau form in the midst of flashing attacks and counters. His humor is fast, punny and ranges even more than techniques, sometimes missing completely but welcome and much more like over hearing the way most martial artists actually sit around and analyze their friends and compatriots. Wing Chun lends it self perfectly to this kind of "real time" analysis and - if you have eyes - you will see a lot. Everyone in Wing Chun works with Siu Leem Tau. And Bil Ji is the "inner door" art and therefore well practiced. 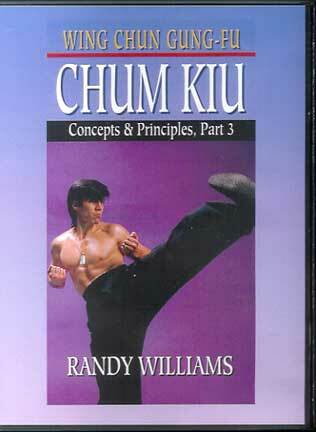 Chum Kiu is like Wing Chun's "work horse". Footwork is introduced, kicks, dissolving the opponent's power, outside and inside covering. This is the FIRST of the THREE PART breakdown of t his form. In each of these Sifu Williams not only shows the form but goes into extensive explanations on the meaning and usage of each section of the form including stance pivoting, joint locking, body reference, elbow blocks, leg checking, waist trapping and much more. 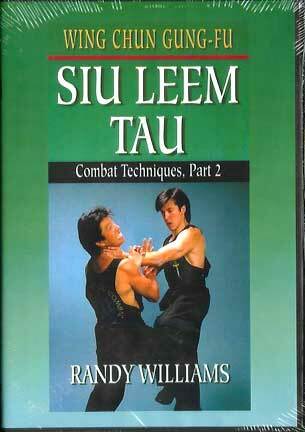 Everyone in Wing Chun works with Siu Leem Tau. And Bil Ji is the "inner door" art and therefore well practiced. 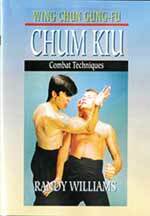 Chum Kiu is like Wing Chun's "work horse". Footwork is introduced, kicks, dissolving the opponent's power, outside and inside covering. This is the SECOND of the THREE PART breakdown of t his form. In each of these Sifu Williams not only shows the form but goes into extensive explanations on the meaning and usage of each section of the form including stance pivoting, joint locking, body reference, elbow blocks, leg checking, waist trapping and much more. 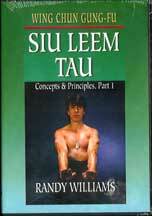 Everyone in Wing Chun works with Siu Leem Tau. And Bil Ji is the "inner door" art and therefore well practiced. 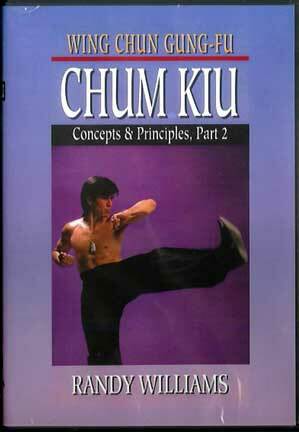 Chum Kiu is like Wing Chun's "work horse". Footwork is introduced, kicks, dissolving the opponent's power, outside and inside covering. This is the THIRD of the THREE PART breakdown of t his form. In each of these Sifu Williams not only shows the form but goes into extensive explanations on the meaning and usage of each section of the form including stance pivoting, joint locking, body reference, elbow blocks, leg checking, waist trapping and much more. 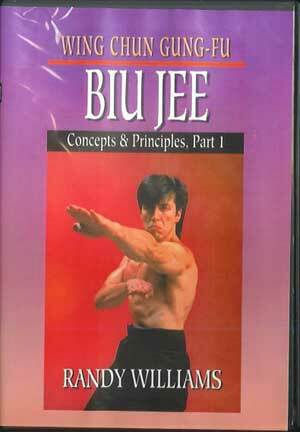 Biu Jee is the highest hand form in most Wing Chun branches. It takes the energies developed in the other two forms and refines them to pin point accuracy and power. This master form is the kind you could learn in a month and practice for a lifetime. Finger movements are introduced, per the name, but also the movements correspondent to this forms OTHER name Gup Gow Sao or "emergency hand". We had a similar thing in Kenpo with what some of us called "oops" techniques which were the kind, crude and effective, that you did when things turned nasty quickly. In this FIRST part of the THREE PART series on this form Sifu Williams introduces the form and then, while doing the breakdowns, goes into lengthy and thorough information on the applications and meanings of Biu Jee components which include Sticky Footwork, Kick Evasion, Butting Elbow strikes, hair grabs, complex arch attacks and much more . Biu Jee is the highest hand form in most Wing Chun branches. It takes the energies developed in the other two forms and refines them to pin point accuracy and power. This master form is the kind you could learn in a month and practice for a lifetime. Finger movements are introduced, per the name, but also the movements correspondent to this forms OTHER name Gup Gow Sao or "emergency hand". We had a similar thing in Kenpo with what some of us called "oops" techniques which were the kind, crude and effective, that you did when things turned nasty quickly. 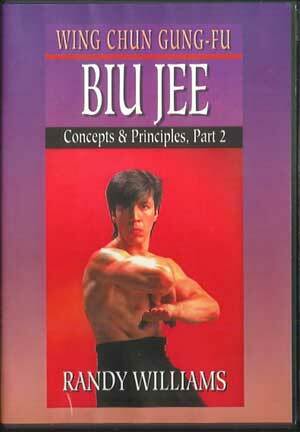 In this SECOND part of the THREE PART series on this form Sifu Williams introduces the form and then, while doing the breakdowns, goes into lengthy and thorough information on the applications and meanings of Biu Jee components which include Sticky Footwork, Kick Evasion, Butting Elbow strikes, hair grabs, complex arch attacks and much more . 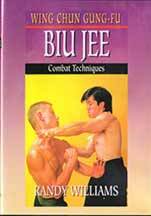 Biu Jee is the highest hand form in most Wing Chun branches. It takes the energies developed in the other two forms and refines them to pin point accuracy and power. This master form is the kind you could learn in a month and practice for a lifetime. Finger movements are introduced, per the name, but also the movements correspondent to this forms OTHER name Gup Gow Sao or "emergency hand". We had a similar thing in Kenpo with what some of us called "oops" techniques which were the kind, crude and effective, that you did when things turned nasty quickly. 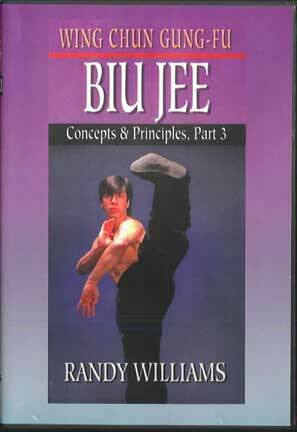 In this THIRD part of the THREE PART series on this form Sifu Williams introduces the form and then, while doing the breakdowns, goes into lengthy and thorough information on the applications and meanings of Biu Jee components which include Sticky Footwork, Kick Evasion, Butting Elbow strikes, hair grabs, complex arch attacks and much more . Ted Wong and others aid in this in-depth DVD on sticky hands. #1 starts with basic single patterns. His details are quite specific and clear. Then he gives multiple demos for you to mimic. He shows variations of single Chee Sau, such as running hands. Next he adds steps. Double hands next. He also show switches and melds of single and double hands. Typically, for Williams Sifu, his DVD are rich with exercises and drills. 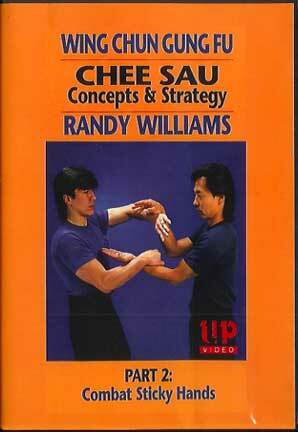 Having given the patterns in the previous DVD, Williams Sifu goes on to combat Sticky Hands. His approach utilizes four positions from which to launch all attacks. Most people just want to jump into Chee Sau. Williams Sifu's approach is organized and progressive. Many examples are shown utilizing a wide range of strikes including elbows, head butts, palms and grappling actions.